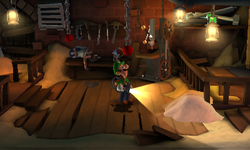 The Workshop is a room inside of the Old Clockworks in Luigi's Mansion: Dark Moon. The Workshop can be accessed by taking the door to the right on the first floor of the Warehouse or by taking the left door inside of the Clock Tower Gate. The Workshop is a small room covered in sand. There is a table and a shelf with various tools, such as a wrench and screwdriver. To the right of this table is a drill press. Some old tires are found in a corner and there is a shelf with large metal parts. There are two vents with chains that can be yanked. The door on the left takes Luigi back to the Warehouse while the door on the right takes him to the Clock Tower Gate. During A Timely Entrance, Luigi must go through the Workshop to get to the Clock Tower Gate. When he enters the Workshop, he notices two Greenies with welding masks and mallets hitting a giant robotic bomb. Activating this bomb and waiting for it to explode blows off the Greenies' protection and stuns them long enough for Luigi to catch them with his Poltergust 5000. Yanking on the chain hanging from the ceiling releases a Gold Greenie. In Underground Expedition, if Luigi tries to enter the Workshop, Professor E. Gadd calls and berates Luigi about ignoring his duty. After Luigi clears the way to the Roundhouse from the underground, he can enter the Workshop. In Roundhouse Brawl, the entrance to the Workshop is blocked by a large spider web, but can be burnt by a Robomb. In Play Catch, the Workshop is the first room that the Polterpup hides in. The Polterpup hides in the drill press, but flees to the Drafting Office after locating it. During Outlandish Interruption, the Workshop might be one of the rooms infested with ghosts.